Product news: each of these lamps by Swedish design duo Mats Broberg and Johan Ridderstråle for Nordic furniture company Muuto is shaped like a single leaf at the end of a long stem. The Leaf lamps by Broberg & Ridderstråle for Muuto combine aluminium, steel and brass stands with energy-efficient LED technology. 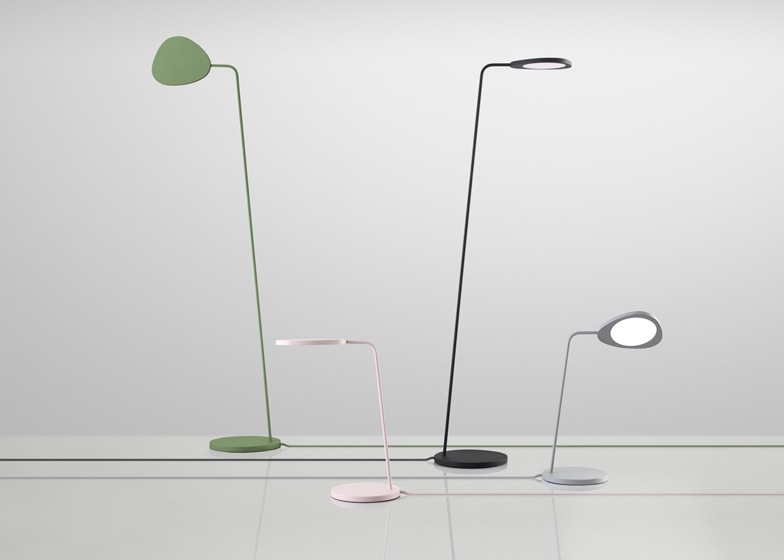 The Leaf lamp is available in table and floor versions and comes in black, white, grey, rose and green. Broberg and Ridderstråle founded their Stockholm-based architecture and design practice after graduating together in 2006 from Konstfack University College of Arts, Craft and Design. This is the second lamp from Broberg & Ridderstråle for Muuto, following the Plugged Lamp designed in 2008. Previous products by Muuto on Dezeen include a chair formed from laminated plywood shells slotted together and some containers shaped like little birds by TAF.